Allan Hildebrand, owner and operator of Working Iron, was born and raised in Huron County just north of Auburn, Ontario, Canada. Allan learned farming at home, operating the family farm with his parents and siblings. Through the years he became proficient at maintaining and repairing equipment, both as a mechanic and as a welder. Eventually he became an auto body apprentice working for Seers Auto Body in Auburn, and later became a licenced Auto Body Mechanic. Through this training and experience, he developed an eye for accuracy and an ability to manipulate steel. He even developed farm equipment and hand tools for his own use with great success. By 1993 it was time for Allan to branch out. He became employed by George Smyth Welding of Dungannon, Ont. During his employment in Mr. Smyth?s welding shop, Allan gained experience with different equipment from what he had used on the farm. He learned to weld with the mig welder, cut with a plasma cutter and became experienced with other larger equipment as well. In 1995, Allan left George Smyth Welding to work for a blacksmith. In the next nine years, while working for this blacksmith, Allan developed his skills to such an extent, that he was an important part of this operation. Allan's strong mathematical ability, accompanied by his natural engineering talent, gave him the ability to accurately measure and build everything from furniture and stair railings, to larger and more complicated projects. Projects such as a completely rebuilt lighthouse lantern, Pelee Island's 1833, and the Corpus' Cross for St. Peter's Catholic Church, in Goderich. These were successfully built by following the instructions and details supplied by the architects involved. Other interesting projects he worked on while with the blacksmith include building a folding chair for a Toronto Magician to use in his act. A portion of this performance was presented in the introduction of a David Suzuki program, titled 'Mathemagicians'. Since striking out on his own in 2004, Allan has accomplished much, including becoming a locally known metal artist and fabricator. 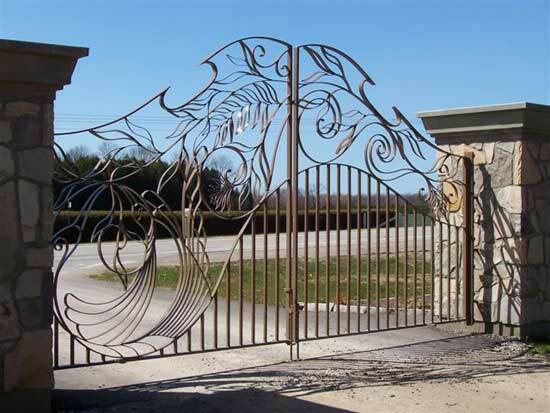 This is evidenced by his largest project yet - the beautiful, earthy gates that not only have thrilled his client, but function with the touch of the finger. 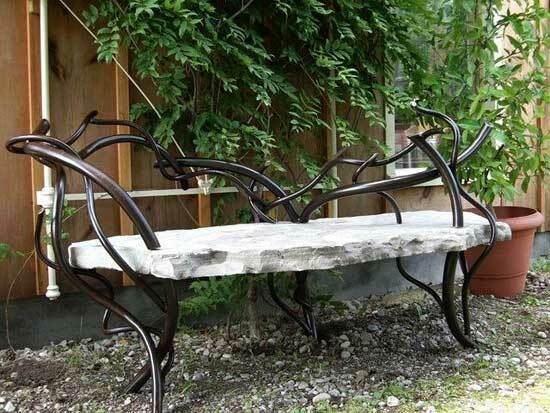 Other smaller pieces are on display at Marten Arts in Bayfield, including the Vine Stone Bench, which is unique and very beautiful-a wonderful addition to any garden! Allan creates, designs and builds truly beautiful, functioning and practical iron works , and works of art.